I daily get recipes in my email which I mostly delete without opening unless something really interesting appears in the subject line. This time it was ‘the best steak marinade in existence’. I had taken out steak this morning so naturally was intrigued, and the ingredients are pretty simple and in all our kitchens. 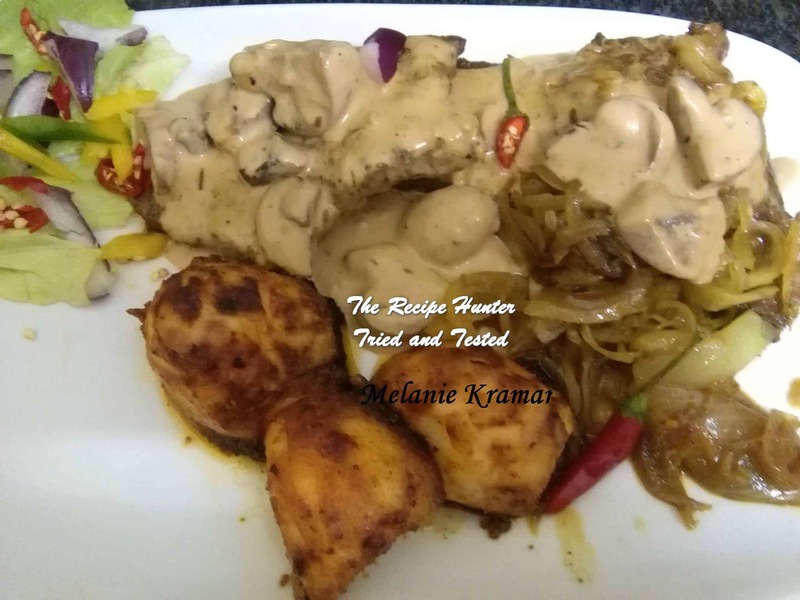 Decided on mushroom sauce with it and stumbled on a different recipe on another group, different to my norm, Dianne Mushroom Sauce. Cool. Made that. OK Potatoes next. Came across Tandoori Potatoes on another Group. Easy peasy I didn’t have to think on what to make for supper. Oh, the caramelized onions were my own. Blend on high-speed for 30 seconds until thoroughly mixed. Pour marinade over steak and marinate for up to 8 hours and cook as desired. I marinated steaks for about 5 hours. Then I made oil (about ¼ cup) quite hot and fried for 2-3 minutes a side. Add the basil and cumin and fry for a few seconds. Add wine / stock and reduce. Add Worcestershire sauce, tomato sauce and cream and bring to the boil. Firm potatoes washed and scrubbed with their skin on cut in halves or whole. Steam potatoes in the microwave with a little water and some salt for 10 minutes. Mix all the dry ingredients with the chopped curry leaves first, followed by the wet ingredients (excluding oil). Drizzle oil in baking dish. Add potatoes and grill until crisp. Add the sliced onions to a bowl. Add the boiling water and vinegar and leave for 5 minutes. Drain and dry in a paper towel. Heat oil in pan and add onions, add salt, turmeric and sugar and stir on low heat for about 15 minutes. Add Worcestershire sauce last 2-3 minutes.